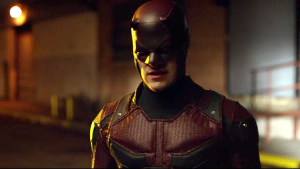 Daredevil turned out to be the superhero television show we’ve always wanted to see on the small screen. While The CW’s offering of Arrow and The Flash are fairly decent (albeit, frustrating at times for me). and Agents of S.H.I.E.L.D. is improving, Daredevil was almost pitch perfect. I’m not the only one who thinks that as Rotten Tomatoes pegs the series at 98% fresh, and Netflix has already ordered a second season of the show. Collider sat down with star Charlie Cox and asked him about the next season. I have to be careful because we just got commissioned so I have no idea who is going to turn up. Based on the show we’ve created, which is very grounded in reality, I’d like to see Punisher maybe show up, a little bit of Elektra maybe. I wouldn’t mind Black Widow making an appearance, and you can’t think about Daredevil for too long without thinking of Bullseye. I don’t know when or if or how that would happen, but it’d be cool if it did. Spider-Man and Daredevil also have a long history together in the comics, but I doubt they would introduce him in a television series. It might be possible for Charlie Cox to appear in a Spider-Man movie at some point, however, but that will ultimately be up to Sony and Marvel. Cox also reveals when they would start shooting and confirms my suspicions of when it would air. We’ll begin shooting in the second half of the year. It’ll be the same timeline as the last show, so season two will come out about this time next year. Again, I’m imagining all this, but they’ll probably do Iron Fist or Luke Cage at the same time, followed by the other one [of the two] in the first half of 2016 and then maybe Defenders in the second half of 2016 or the beginning of 2017. Structurally, this is sounding a lot like Phase: One of the Marvel Cinematic Universe. The release order of that was Iron Man, The Incredible Hulk, Iron Man 2, Thor, Captain America, and The Avengers. This seems to be Daredevil, AKA Jessica Jones, Daredevil Season 2, Luke Cage, Iron Fist, and The Defenders. The only thing that can throw off that schedule is if AKA Jessica Jones gets a second season before The Defenders, which is possible, but I doubt either Luke Cage or Iron Fist will get a second season before the team-up series. I’m currently guessing that the Hand will be the villains for The Defenders miniseries, which really makes me believe that Elektra will be in the next season of Daredevil. Daredevil season two will premiere in 2016 on Netflix.